Teardrops n Tiny Travel Trailers • View topic - Ok Transfer and License ? Ok Transfer and License ? Teardrop #1 will be making the 800 mile trip to it’s new home in Durant, Ok the end of the month. It had already been inspected, titled and licensed in Iowa as a camper trailer. My daughter would like to know ahead of time the procedures and costs to transfir it to a legal Ok registration. Unless it's not coming out of Oklahoma it should be licences, in some states it has to have a plate on it. I got pulled over here in Arizona when I built my first teardrop and was told to get it licenced or get ticketed. Nice cop just gave me a warning. All states are different. In Tennessee, you do not have to have a tag, unless you carry it out of state, then it is required. I live in Iowa too and am looking to start building my own TearDrop soon. What does it take to license one in Iowa or can you point me in the direction of where to find info on doing so? Is it through the DOT or the county? I've looked but not found anything. A friend told me you could license just the trailer & not worry about licensing the Tear after it's built. Don't know that I can trust their advice (a non-teardrop friend). The plan is to build a 4x8 on a Harbor Freight trailer(yet to be purchased). My life's work is to be my dog's servant, pay his rent, drive him to the park, and keep his food bowl full! Iowa considers anything with sleeping quarters in it to be a camper. 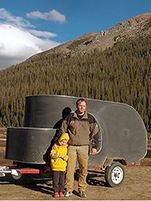 Very simple procedure for titling a homebuilt teardrop. You need to keep all reciepts and make sure you separate the ones which you have not paid sales tax on. You will need to pay this tax when you title it. When you have your camper road worthy with all lights working call your county treasurer. They will have the number of the DOT inspecter. He will give your camper a quick look, check your paperwork, figure sales tax owed and stamp numbers on the tongue. No charge for him. You then take paperwork he gives you to your treasurers office and pay the money for the title and plate. OK Tax Commission has a web site with a PDF at http://www.oktax.state.ok.us/rules/rule6005.pdf . Look on page 26 of 103 on the PDF for OK's definition of a travel trailer. I think pretty much all she will need to do is take IA title and registration to the local Tag Agent and they can help her. It's really no big deal. Sorry, but I don't know how to do a tiny url. I don't get it...pay taxes for items bought without tax...on something you build from scratch?? That's just crazy!! I live in Des Moines. I'm in the process of building a garage and boy, that will give you a quick lesson in laws, codes, regulations, and what you can and cannot do! Like "you need a permit to do what????" "Honestly, I didn't know that!" I know the rules are there to protect everyone, but I really wish they were written down somewhere! Just don't want to make the same silly mistakes with the Tear. The way I am reading things Oklahoma like Iowa considers a teardrop a travel trailer and legally it needs to be licensed. Should be just a simple transfer for my daughter. It's not hard to understand Iowa does not want to miss out on any taxes The worst part is if I were to build one license it and pay taxes due today Then sell it next week sales tax would be due again on the whole sales price. GHOSTSSX wrote: I don't get it...pay taxes for items bought without tax...on something you build from scratch?? That's just crazy!! Better than paying sales tax on the whole amount! This is just a way to collect sales tax on private sales. Most places you are required to remit the sales tax that you didn't pay to the vendor on a private sale. No-one ever does this of course (I'd bet most places it would take you a week to get the goverment agent to track down the form) except for items that have to be registered. Could be worse, Washington state residents used to effectively pay a 2.2% sales tax every year on their cars. The fee for registration was based on the vehicle's current value.